We use an interface to OMDb API. This step is only necessary if you use Perfect Pleyer, MAG or MyTVOnline (Formuler). Other players are unable to display VOD information. In the first step, you should select the correct content of this group. For IPTV see "EPG ID assignment". We are looking for original title of the movie or series. For movies, you can improve the search result by adding the release year in the title. If you are unsuccessful with automatic assignment, you can search for the movie directly on the IMDB website and enter the IMDB ID. After saving, the information is added. The IMDB ID always begins with the string "tt" followed by a number combination. 3 = If you select this option, the titles of the movies will be replaced by those from the IMDB after the automatic assignment has been completed successfully. 5 = Start automatic assignment. The changes are not saved afterwards. Please click on "Save" or select next page or group. You should first assign the affected series. Use the field "Series name" and click on the search symbol. If you are successful, we will display the information of this series. After that you can try the automatic assignment. For the automatic assignment to work, the title of the series should contain the season and episode in the following format: "S01E01" (S + two-digit number + E + two-digit number). 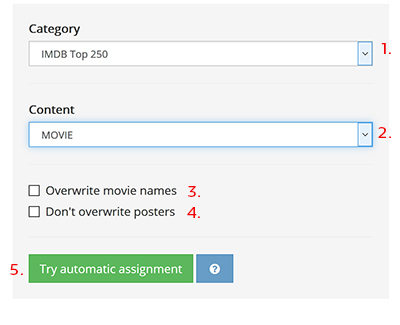 4 = If you select this option, the titles of the movies will be replaced by those from the IMDB after the automatic assignment has been completed successfully. 6 = Start automatic assignment. The changes are not saved afterwards. Please click on "Save" or select next page or group. 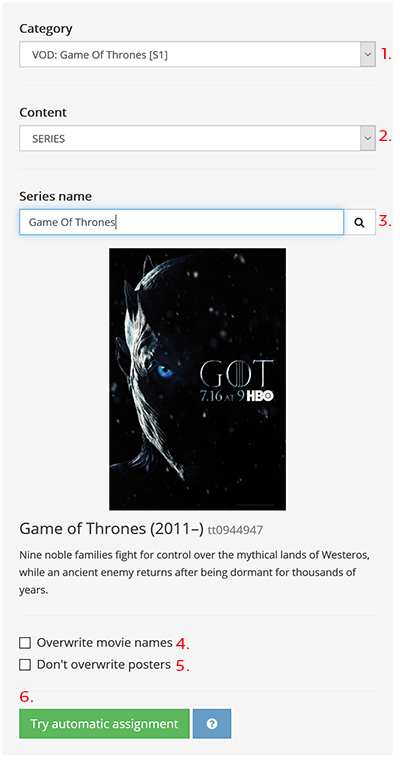 You can try to retrieve the IMDB data for each single movie or series. Just click on the search icon in the "Title" field. If you succeed, the information will be sent directly to you. Another possibility is to search the title directly on the IMDB website and enter the ID directly in the "IMDB ID" field. An example of an IMDB ID "tt2975590"